For the second time in five years, stakeholders in South Sudan are watching the calendar with a mixture of hope and fear. Hope because for the first time in more than two years, Dr Riek Machar, the leader of the opposition Sudan People's Liberation Movement-in-Opposition, SPLM-IO, is to return to Juba next month. Fear because as the principal leaders make bold moves to cement a fragile peace, many issues remain unresolved. It is an extraordinary moment, however, because in an unprecedented move, Pope Francis has also invited the two principals to a peace retreat at the Vatican next week and also promised to make a pastoral visit to South Sudan at a yet-to-be-named date. With an unusual confluence of circumstances, the latest shot at peace cannot be dismissed as just another gamble. A major difference between past efforts and the current push is that it has been evolutionary and the issues put on the table have been raw and less academic. This has allowed a more honest dialogue to take place and narrowed the differences. But while mediators have played a role in facilitating the dialogue, the key conversations have been between the two principals--the figures whose personal rivalry has been seen as a contributing factor to the conflict. 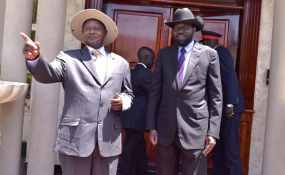 In his brief to Uganda's President Yoweri Museveni, on whom he called this past week, President Salva Kiir said there had been progress on the path to peace except for issues such as disagreement on some state and district boundaries that are still pending resolution. The signs on the ground are good too, with many members of the SPLM-IO back in Juba for the first time in more than two years. One can only hope that the momentum is not lost and that this progress allows the many internally displaced and others who have been forced to cross borders to return to their homes in the near term. Another silent and unresolved issue is the headcount of combatants, their locations and the creation of a unified army. Without an honest verification of troop strengths, the desired configuration of a national army as well as demobilisation and resettlement, suspicion will remain. One can only hope that experiences of the past five years have convinced both sides of the futility of violence as a tool for resolving differences and the indivisibility of South Sudan. In the new interconnected world, the shockwaves from the conflict in South Sudan go well beyond its borders. Besides denying the direct victims of war the right to a decent livelihood, neighbouring countries have also suffered a double blow. They have had to host waves of refugees while the collapse of the South Sudan economy has denied them a valuable trading partner. The test for the principals now, is to run that last mile and lay the foundation for a durable peace. Achieving that will require them to think beyond themselves and look at the plight of the millions of people behind them.